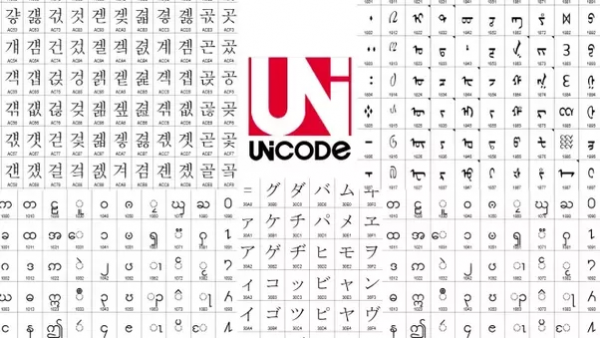 Unicode is the text encoding standard that includes hundreds of thousands of characters. Basically, it lets any computer and web browser view characters like this 漢 and this 🍈 (as long as the font supports it) and also includes some special features that we will show you. This was a great step up from the previous leading standard which was ASCII that was not much more than 0-9, A-z and hence alienated the whole of Asia and the Middle East. The standard typing characters aren’t enough for some bands. The witch house genre includes many cool examples of bands using nonstandard/‘special’ characters in their band and song titles. For instance, the band Black Ceiling is often stylised as BL▲CK † CEILING and has song titles including †† [like a prayer]. Another possibility is using the script of a non-English language. In fact, this is by far the most common use of Unicode special characters. For instance, take the excellent song Machine Girl – 覆面調査員 (GabberTrap Mix) [Frenesi remix]. This allows you to include non-English scripts in writing, translations on webpages and exotic characters in your digital art. Translation to Arabic: هذا يسمح لك لتشمل النصوص غير الإنجليزية في الكتابة والترجمات على صفحات الويب والأحرف الغريبة في الفن الرقمي الخاص بك. You may have noticed something about that previous Arabic translation. Arabic is conventionally written right-to-left rather than English which is always left-to-right. The title is “مفتاح معايير الويب!” in Arabic. The title is “مفتاح معايير الويب!‏” in Arabic. The second one has a left-to-right marker that reverses the applicable Arabic text so that the entire thing is written in reverse order. Nifty. Using these markers does require a bit of fiddling around though and it’s a bit difficult because they are invisible. There are text editors that display them however, such as Vim. It should be noted that some scripts particularly Chinese and Japanese often run top-to-bottom. Unicode doesn’t have a feature that supports this because it is somewhat easy to achieve using formatting. There is more to spaces than just pressing the space bar, a lot more, and here is a quick run through of Unicode’s main ‘space’ characters. Space: The space bar character. In HTML, multiple spaces are collapsed into one space. Tab: A flexible width that goes up until the next imaginary horizontal line down the page. Used to align text but doesn’t work in most cases in HTML. Carriage return: This is the Enter/newline character. Yes, despite appearances it is essentially a character. Zero-width space: An invisible space character. It’s ‘breaking’ so it means you can insert it between two consecutive characters so that they will break even when they otherwise wouldn’t. E.g. you could insert it between the words in Zero​Width. Or, a common use is if you have a string of characters like ☆​☆​☆​☆​☆​☆​☆​☆​☆​☆​☆​☆​☆​☆​☆​☆​☆​☆​☆​☆​☆​☆​☆​☆​☆​☆​☆​☆​☆​☆​☆​☆​☆​☆​☆​☆​☆​☆​☆​☆​☆​☆​☆​☆​☆​☆​☆​☆​☆​☆​☆​☆​☆​☆​☆​☆​☆​☆​☆​☆​☆​☆​☆​☆​☆​☆​☆​☆​☆​☆​☆​☆​☆​☆​☆​☆​​☆​☆​☆​☆​☆​☆​☆​☆​☆​☆​☆​☆​☆​☆​☆​☆​☆​☆​☆​☆​☆​☆​☆​☆​☆​☆​☆​☆​☆​☆​☆​☆​☆​☆​☆​☆​☆​☆​☆​☆ and you want them to wrap, you insert a zero-width space between each one. and you want them to wrap, you insert a zero-width space between each one. Joiners and Non-joiners: Types of spaces that causes otherwise unconnected words to be joined (Joiners) or connected words to be disconnected (Non-joiners). These are fairly advanced and rare characters. A lot of different sizes of spaces: There are way more than just your standard space. They go from hair space ( ) all the way up to em space ( ). And there are sooo many more variants than this. You can seriously have these things going all over the page using this tool or similar. These little characters on top and below of the regular ones are called combining characters in Unicode. Basically, Unicode has these characters that don’t occupy a space on their own, instead they combine with the character next to them to modify it. There are a lot of these that allow you to add diacritical marks to any letter and this is useful when writing in other languages. For instance, you can create this letter x̅ if unicode doesn’t have that as a single character. You can do all kinds of things like strike-out characters, encircle, etc. Now hopefully you have been opened up to a world in which the text that you enter on websites, text documents, word documents, Photoshop and music titles can be formatted in numerous ways. Your imagination is the greatest limit when it comes to combining characters, special characters, spacing, text direction and any combinations of those.